In 1972 Paula Keogh becomes a patient in M Ward, the psychiatric ward of a Canberra hospital. While there, she meets the poet Michael Dransfield. They fall wholly and boldly and ecstatically in love. Paula discovers a self she thought she had lost, while Michael is inspired to write the poems that become The Second Month of Spring. Together they plan for ‘a wedding, marriage, kids – the whole trip’. But M Ward is a liminal, purgatorial place – a twilight realm where patients endure the existential pain that is mental illness. Madness and grief challenge Paula and Michael’s luminous dream. Can their love survive? 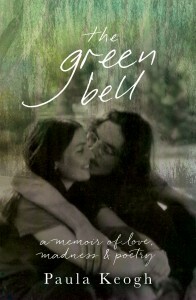 The Green Bell is a lyrical and profoundly moving memoir about love and madness. A hymn to life. A requiem for lost friends. A coming of age story that takes a lifetime. Shortlisted for the NSW Premier’s Literary Award for the Douglas Stewart Prize for Non-Fiction. Longlisted for the 2018 Stella Prize.